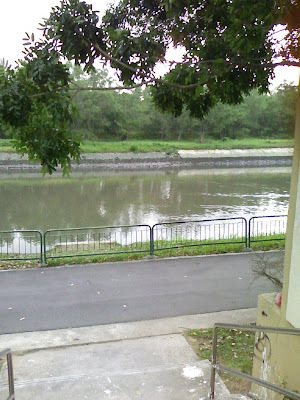 I have updated this entry with pictures which I took of the Serangoon River near to Serangoon Secondary School on 25 Feb 2009. Check out the bank protection and the natural vegetation available on the opposite bank. There seems to be some development work in progress as you can see some machinery at work in the far distance. Will the soil from the barren land be washed into the river? 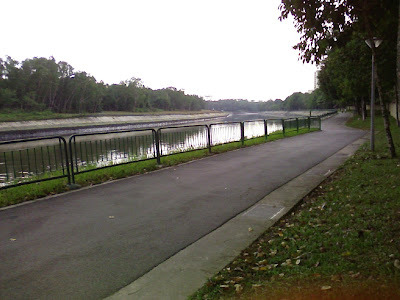 Sungei Serangoon is 8 km long, starting as a canal near Tampines Road. 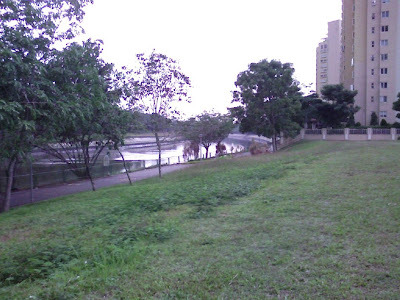 It flows through Hougang, where it is joined by tributary Sungei Pinang just before Sengkang. After that it flows towards Lorong Halus where it is joined by another tributary Sungei Blukar, before emptying into the Serangoon Harbour. The river is also known as the Serangoon Estuary. 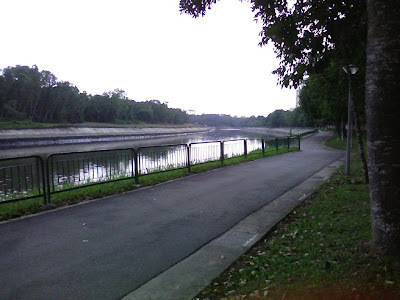 The stretch of the river which I took below has a 2.2 km jogging track which is known as the Serangoon Park Connector running along its western bank. Although this stretch is close to residential areas, a variety of garden, grassland and estuarine birds can still be found there. Sections of the river have been canalized at Hougang and Lorong Halus. Plans are underway to dam up the estuary of Sungei Serangoon to form a reservoir, to be ready by 2009 as reported on wikipedia. 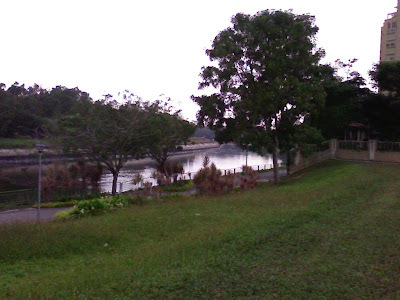 Photos which I took of the Singapore River and the Marina Barrage on 5 Feb 2009. Look at the efforts to protect the banks as well as ensuring that the river is cleaned. Refer to Wikipedia for more information on the Singapore River. Bank protection with walls made of granite. River taxis which provide river cruise for tourists. Will the growth of the tree roots into the artificial embankments affect the river? More workers cleaning up the river. Cleaning up the river Photo 2. Cleaning up the river Photo 3. How the Marina Barrage works.